Bring a large pot of salted water to a boil, add the pasta, and cook according to the package instructions or until al dente. (8-12 minutes in this case) Drain and rinse with cold water till completely cool. While the pasta’s cooking and cooling, get the other ingredients ready. In a large serving bowl, add the pasta and the remaining ingredients. Mix till well combined. The picture is being sent for the latest round of CLICK, a theme-based monthly food photography event started by Jai and Bee of Jugalbandi. This is also being sent to Ruth who hosts the weekly event, Presto Pasta Nights. the pipettes are adorable. thanks for your entry. Sounds really simple and delicious! yum! looks so creamy...also loved the pic!...aha..u are a late-latif like me!! wow...creamy and yummy. Looks beautiful. 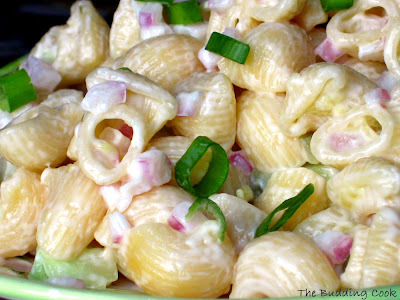 The scallions and red onions gives a nice contrast to the pasta. Nice entry. Scallions give such a pretty accent to the whole salad! Must be really great tasting, TBC! Absolutely beautiful looking salad and perfect for brunches or a side dish for the big Thanksgiving feast. Thanks for sharing with Presto Pasta Nights. Love this salad. Nice picture. I just usually add some vegetables, as my daughter will eat pasta in any form and I can get her to eat her share of veggies!! BTW, where in Kochi are your parents? TBC, I love the way the purple peeks through the golden pasta. To answer your question on my blog, no, I don't have a problem with the entry being submitted for multiple events. Looks colourful TBC and great entry with that!!! Beautiful! It looks so fresh and delicious! Simple and delicious = perfect food! I love pasta salad and the addition of some relish is really unusual! Love pasta salads, that picture looks beautiful! Cucumber in pasta is new to me. Anon, I have updated the post with a link to the relish I used.